treatment specifically designed to integrate the life cycle of the hair. The range is formulated with a special growth factor : the Bifigen Redox ®, developed by Napura to stimulate and increase the activity of the hair follicles. Specific shampoo to cleanse gently and prolong the anagen phase of hair growth. Through its treating with vitamin H, Superoxide dismutase (SOD), specific plant extracts such as Licorice, Green Tea and Saw Palmetto, strengthens the hair, revitalizing and protecting them from agents that inhibit growth. The surfactants used in the formulation are extremely delicate and SLS free. ANAGEN SHAMPOO brings great vitality to the hair, giving softness, volume and shine. Daily use. Fluid designed to integrate and optimize the growth of the hair. ANAGEN POST contains specific plant extracts including Licorice, Green Tea, and Hops, which strengthen the hair, revitalizing and protecting them from agents that inhibit growth. 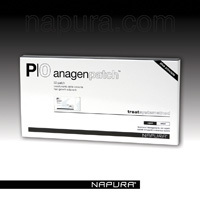 The treatment ANAGEN POST brings a vital nutrient that promotes natural growth and improves hair texture. Daily use. Concentrated fluid designed to integrate and optimize the growth of hair in specific areas of the scalp. 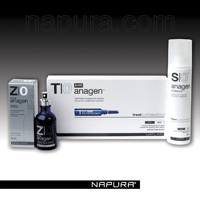 ANAGEN ZONE contains specific plant extracts including Licorice, Green Tea and Serenoa repens, which strengthen the hair, revitalizing and protecting them from agents that inhibit growth. Daily use.